Normal service will now resume… | carpe diem! I tried to post yesterday but Blogger stopped talking to me when I tried to upload this photo. Is someone trying to tell me something? 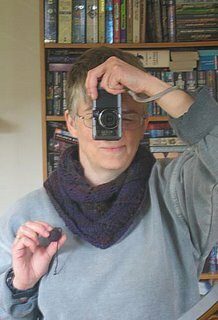 It can’t be a complaint about the Moebius cowl because *that* is lovely. I didn’t want to take it off, it curls around my neck like a warm cat — the only thing missing is a purr. And I think my cunning plan worked: just look at how much yarn is left over. If anyone else wants to know: I used 66yds of yarn for the lace edge (I did 8 rows/4 pattern repeats instead of the 3 repeats in the pattern because I liked the look of it) and the edge. Next time I make one — and there will be a next time — I’ll measure 66yds as a separate ball and Just Knit the rest. I could make it slightly smaller in diameter, too. And finally, a swatch! I must have grown up, I’m actually taking time to do things properly. This is Handmaiden silk/wool on (well, off, really) 4mm needles. I made it long enough that I could block *half* of it so the swatch would record the difference for future reference or posterity, which ever comes first. I am going to knit the cap-sleeve top. Or try to knit it. Something about that photo makes me wonder if it will fit across real shoulders. But I read that top-down knitting allows me to test it as I go, and if it doesn’t work I might try to make a Picovili instead. This entry was posted in Uncategorized on April 25, 2006 by sarahw. 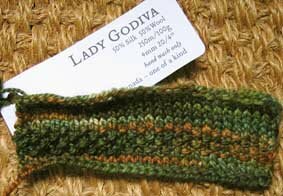 I have coveted the Lady Godiva yarn but have been thinking the shipping charges must be quite high. The cap-sleeve top really looks nice. 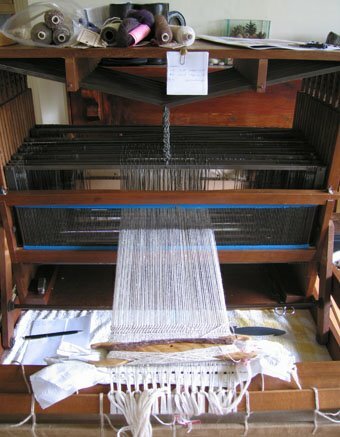 I’d like to try that but my tension goes so up and down, I’m better off making socks and shawls at the moment!